Working with a youth choir can be a fun, inspiring, rewarding, and deeply meaningful experience. As a director, you balance the responsibilities of building community, integrating service, sharing meaning, inspiring purpose, and fostering musical development. But how do you approach musical growth and development for young voices? How is it different from working with children's voices or adult voices? What do you do when male voices begin to change? The primary things we help young singers with are breathing and tone. Encourage and remind singers to take deep, low breaths. Try a rhythmic chant exercise (chanting the rhythm of a familiar tune on different consonants) or conduct the group at different tempos, chanting on a syllable such as "ch" or "sh." Try adding in gestures to elicit short, staccato sounds and long, legato sounds. Play the Invisible Box game. Scrunch your fingers together on one hand and outline an invisible square in front of you. Keeping a steady beat, move your hand to each corner of the box and to the middle, in random order. Each time you touch a corner of the box, singers chant "sh." When you touch the middle of the box, singers should be silent. Ask for volunteers to lead this one as a quick change of pace in the middle of rehearsal. Hold a Paper Airplane Contest. Singers take turns throwing paper airplanes and leading the group in a vocal siren on "oo" or "ah." The higher the airplane flies, the higher the voice goes. The person whose plane flies the longest or goes the farthest wins! The upper register of a young singer's voice is clear, flute-like, and supported. The middle register is slightly breathy, full, and robust. The lower register is rich and warm. Adolescent girls, in particular tend to sing in more of a mixed register. Warm-up all three registers at the beginning of the rehearsal, but emphasize the upper register and bringing that clear, supported sound down into the middle register. Use descending warm-ups with downward motion (e.g. 5-5-5-5 54321). Remind the singers, "Never louder than lovely!" (Sandra Snow). A good rule of thumb for the warm-up range is G below Middle C to G above Treble C, ideally, the octave D-D within this range. Invite singers to stand tall (versus stand straight). This will promote a natural, relaxed stance. For adolescent boys, work the upper and lower registers separately; as they gain confidence, work the connections between registers. The ideal choral sound for adolescent males is rounded, supported, and focused. Keep in mind that, for boys this age, falsetto is not the same as head voice. Listen to your male singers sing often and adjust what parts they sing, as needed, as their voices may change significantly in just a few weeks. Girls also encounter changing voices at this age, though not nearly as pronounced or significant as the male voice. Remember to encourage good breath support and pure vowels. Youth are often looking for experiences that will change their lives and empower them. Choir and the music we sing offers words and meaning to go with those experiences. What is the text? Look for fewer words and repetition (and I would add, text that is meaningful). Is it singable? Look at the range, tessitura, large leaps, chromaticism, and vowels. What is the form? Look for repetition, large sections, regular vs. irregular phrase-lengths. How is the part-writing? Look for exact imitation, ostinatos, and countermelodies, and avoid 3rds/6ths in the harmony (challenging for young singers to sing). What is the accompaniment? If the piece has accompaniment, look for something that's transparent and complementary to the choral parts. What are the musical skills/concepts? Look for canons, pieces with contrasting sections, pieces in different modes (major, minor, dorian), etc. with new skills or concepts you can introduce. Walking is a great way to reenergize singers partway through a rehearsal; plus, it promotes physical relaxation. Get them up out of their seats, singing and stepping in time with the music or with the rhythm of their part. Invite singers to stand tall, sit tall, take deep breaths, drop their jaw, etc. because it will make them sing better. Keep reiterating the importance of singing with our best voices. Create an environment where youth feel welcome and valued. Ask lots of questions (but keep the pace up), demonstrate, and encourage singers to take risks and try new things. Build community by posing a "question of the day" (submitted ahead of time - i.e. "What did you have for breakfast this morning?"). Have singers raise their hands and move quickly around the room to hear people's responses. You'll learn something new about each other and see individual personalities shine through. Give them ownership. Let them vote on a choir name. Ask for volunteers. Put a committee together to design choir T-shirts. Ask for ideas about outreach and ways they'd like to give back to the community. Connect to something meaningful. The youth choir experience is about growing in faith and musicianship. This is different than other group music experiences, with greater mission and purpose. Plan a short weekly devotion to share with the group in the middle or near the end of rehearsal, or put together a devotional committee and have singers take turns leading devotionals each week. 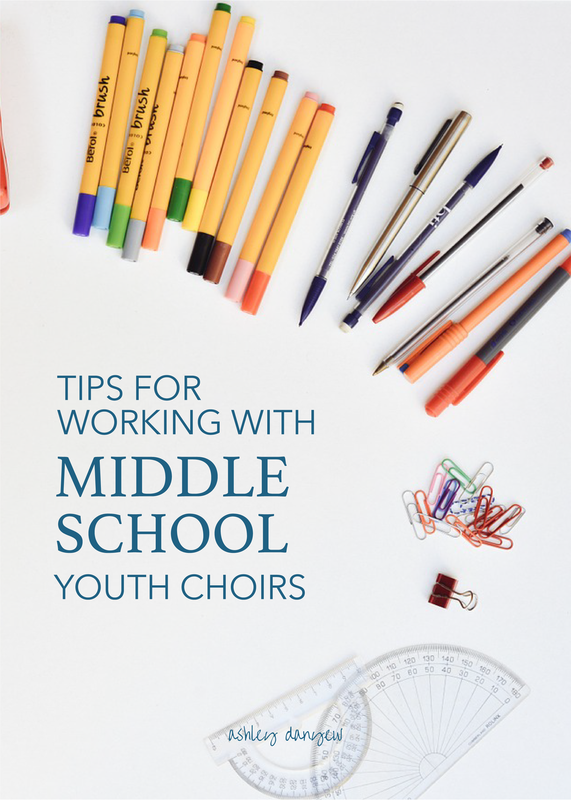 What is your favorite thing about working with a youth choir? References: Swiggum, R. (2005). "Swimming upstream, part II: Hooking singers on great music," Melisma. Retrieved online at http://www.ncacda.org.